For the past couple months for the Sci Fi Experience, I’ve been following the story of Khan Noonien Singh through books and television. My main goal for The Great Khan Adventure was to follow the original arc, but just for fun I decided to wind up with a rewatch of Star Trek Into Darkness. The story centers around a hunt for a fugitive terrorist. When the Enterprise successfully captures him (sort of) on the Klingon homeworld of Kronos (which used to be Qo’noS…), they learn that he’s a genetic superman from the 20th century who has been in cryogenic sleep. Khan is dangerously charismatic, with an alarming story about corruption in Starfleet. I enjoyed this movie the first time around, with reservations—and I enjoyed it the second time around, with bigger reservations. On this go-around, I found myself very focused specifically on Kirk (Christopher Pine) and Khan (Benedict Cumberbatch), probably because this viewing followed directly on all that other reading and watching I’ve been doing. Remember how in Wrath of Khan I had to fight the urge to feel too sympathetic towards Khan? Well…this Khan was a lot darker and a lot more violent and I was pretty clear that I don’t like him at all—but he was still a MUCH more compelling character than Kirk. My big issue with the movie, really, was Kirk. It may in part be because, without question and unequivocally, TOS Kirk (William Shatner) is my favorite Star Trek captain. He always had a streak of arrogance, but I love him because he really is as good as he thinks he is. Reboot Kirk, on the other hand, seems to be far more arrogant and far less competent. I was trying, really, to figure out what exactly Reboot Kirk did that was good in the movie. (Spoilers ahoy!) He starts out by breaking the Prime Directive (saving Spock and an intelligent species, true) which bothers me less than that he failed to get away with it, because TOS Kirk always knows exactly how to bend the rules in just the way to pull it off. Reboot Kirk then sets out to capture Khan, nearly gets his landing party killed by Klingons (I’m pretty sure TOS Kirk would have talked them around, or maybe challenged the Klingon Captain to single combat), and only catches Khan because Khan chose to surrender. Reboot Kirk goes on to bring Khan over to the Vengeance, and then lets him take control of it. Khan neutralizes (with questionable means) the threat of Admiral Marcus, is taken out by Spock, and still nearly destroys the Enterprise. Kirk successfully saves the ship, but meanwhile Khan crash-lands into San Francisco (a major population center! ), to then be caught by Spock. About the only accomplishment from Kirk was rescuing the Enterprise, which happened at the same time that the villain was taking out San Francisco and presumably killing thousands of people. On the whole…not a very impressive track-record for the hero of the movie. Especially for a man who runs rough-shod over good advice from virtually every other character, and is quite confident that he knows all, understands all, can achieve all, and is a marvelous gift to Starfleet and the galaxy. Ahem. Meanwhile, Reboot Khan is pretty far removed from TOS Khan (Ricardo Montalban), but in a way that worked much better than the changes to Kirk. Reboot Khan’s history is thoroughly glossed over and he definitely doesn’t resemble the Sikh prince of Cox’s trilogy… But he does carry the strong sense of superiority, the loyalty to his crew, and the conviction that he’s meant to rule over the lesser beings of the galaxy. I missed Marla in this incarnation, as well as the sense of the benevolent (yet ruthless) leader he was trying to be in Cox’s trilogy. What we did get was a sense that Khan really is smarter, faster and stronger than anyone else. Not necessarily wiser, but in some ways he seems more like a genuine superman than the TOS version. In fact, he’s arrogant—but he really is as good as he thinks he is. The problem isn’t the arrogance so much as the contempt he feels for everyone else. He’s far too violent for me to feel much sympathy for him, but he’s still an extremely fascinating character, with a lot of the charisma that was sadly lacking from Reboot Kirk. I’d quite like to see more stories with this character, especially if he could be less violent but still just as brilliant, arrogant and eminently capable. So much for comments on the hero and the villain–and perhaps I’ll just leave it at that. For a fuller discussion, check my original review. I still stand by it, although the lack of professionalism bothered me less (that’s not acceptance, just resignation) and I noticed a few more plot holes (exactly how do you blow up a starship in orbit of Earth and expect to get away with it?) I definitely still feel there wasn’t enough McCoy. Yeah…not sure what the fascination is with lens flares and flashing lights! I noticed more problems with Into Darkness upon my second viewing of it as well, though I still really like it. 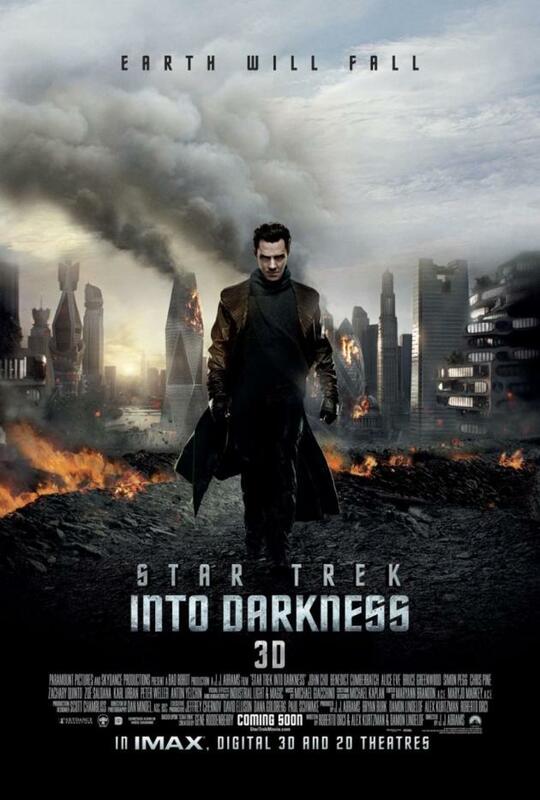 I feel like a bad Trekkie for saying this, but I actually like Cumberbatch’s portrayal of Khan more than the original! I find him more charismatic, personally, even if he is also way creepy. I think you make some good points about Kirk… I know he’s different without having grown up with his father, but what exactly is he accomplishing to be advancing as he is? And you can never have enough Karl Urban as McCoy! Unless they made an entire movie focusing on him. That would be awesome. True, I know Kirk grew up differently…yes, it’s a parallel timeline…but that doesn’t mean he doesn’t still need to be an appealing character. “I had no father so now I’m reckless and a jerk” is no excuse, and doesn’t make me want to like *that* version of Kirk…or understand how he’s advancing so quickly in Starfleet!